This amazing innovation combines everything we love about pizza, pretzels, and secrets. You might not be aware that October is both National Pizza Month and National Pretzel Month, but Sam's Club has been celebrating in secret this whole time. Throughout October (and likely beyond), the Sam’s Club Café will be offering a new item that won't be appearing on the official menu. The new Pizza Pretzel combines two classic snacks into one, and it only costs $1.69. All you have to do is ask for a Pizza Pretzel and the café worker should hook you up. The base of the Pizza Pretzel consists of a soft pretzel, which is then topped with cheese and pepperoni before the whole thing gets popped into the oven. The Pizza Pretzel even comes with a side of warm marinara sauce for dipping. The $1.69 price tag is also a bonus since it's cheaper than a normal slice of pizza, which typically costs about $1.98 depending on the location. 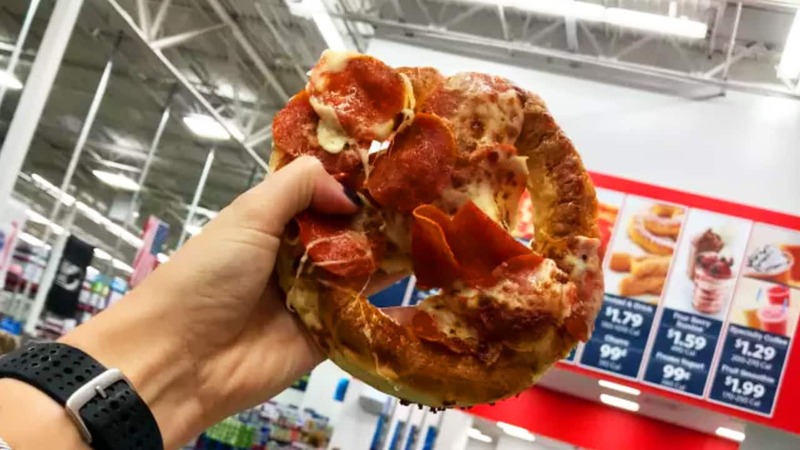 We don't know if the Pizza Pretzel will be enough to convince Costco loyalists to try the Sam’s Club Café, but it sure does sounds like a great way to end a day of bargain shopping. How do you feel about the new Pizza Pretzel? Is this a good reason to pick Sam's Club over Costco? Let us know in the comments below!